Brigadier Harbir Singh, who was injured in an operation against Jaish-e-Mohammad terrorists on Monday in Pulwama district of Jammu and Kashmir, had cut short his leave to lead his soldiers from the front, a senior army officer said Tuesday. "Brigadier Harbir Singh, who is among the injured, was on leave at home. When he realised at midnight that the operation has started, he cut short his leave voluntarily and rejoined," General Officer Commanding of Army's 15 Corps Lt Gen K J S Dhillon told reporters here. 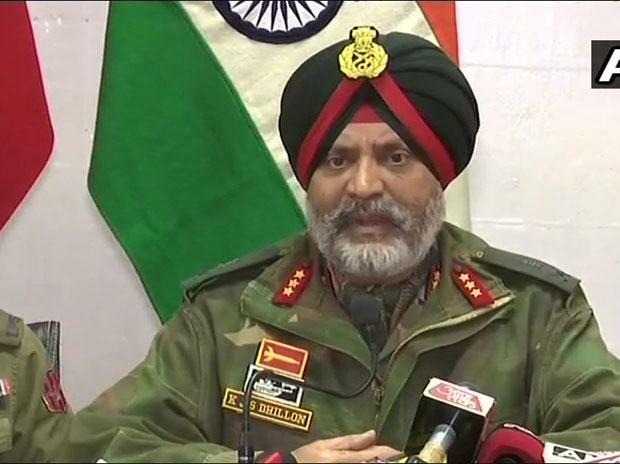 Lt Gen Dhillon was briefing reporters about the operation that led to elimination of three Jaish terrorists who were responsible for the suicide car bomb attack on CRPF on February 14 in which 40 security personnel were killed. "He (Brigadier Singh) came back to Kashmir and went straight to the operational site. He was leading his men from the front. DIG Amit Kumar (who was also injured) again was leading his men from the front and you would see from the injuries to our officers, it shows our commanders were leading the operation from the front and we were able to achieve nil civilian casualties," Lt Gen Dhillon said. He said the Army officers will continue to lead from the front during operations in future as well. Major V S Dhoundiyal, three Army soldiers and a policeman were killed in the gunbattle at Pinglan in Pulwama district on Monday. Several other personnel including DIG Kumar, Brigadier Singh, a Lt Colonel and a captain were among the injured. He said all the personnel, who sustained injuries during Monday's operation as well as those injured in the car bomb attack last week, were now stable and undergoing treatment. Asked about the high number of casualties in the operation, Lt Gen Dhillon said the security forces wanted to avoid any civilian casualties. "There were two to three main reasons for it. We did not want civilian casualties. As you are aware, other than one civilian casualty, which happened due to terrorist fire in the initial stages itself, not a single civilian has been injured in this operation that lasted 17 hours. That is the risk we took, We took it on our chin," he added. Lt Gen Dhillon asked people to not go near the encounter sites. "At the same time, I would like to convey to people to please stay away from the encounter site during the encounter and after the encounter for your own safety. During the encounter crossfire, something can go wrong and after the encounter because of the leftover explosives, it can cause injury or death," he said.